Poker King, the Texas Holdem Poker app from Wayger.com, was released back in November of 2014, so it’s been around a while. It has amassed quite a cadre of loyal fans and it’s easy to see why. Poker King is free and pretty slick, providing a fun opportunity for filling those dead hours on the train or in the car (but not while driving! That would be dangerous.) getting in some poker time. As with any free poker game Poker King attracts loads of poker fish who know very little about how to actually play, which is part of the reason that the reviews of the game are full of people complaining about bad beats. But any professional or experienced poker player knows that a ton of bad beats simply means there are loads of fish in the water. It does make for great frustration at times but that is all just part of the game of Texas Holdem. If you want to play with fish, you have to accept that they are going to draw out on the river at times, and it’s going to hurt. 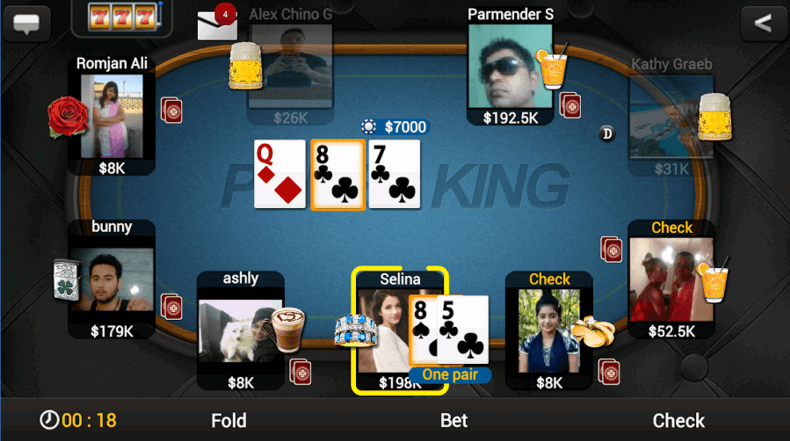 Poker King has been around for a while, as previously noted, and has undergone a few rounds of updates to fix bugs. One common complaint that is recurring in reviews is frequent freezing or glitches, but it is unclear how wide spread of a problem this is or if it might be a software compatibility issue or some other problem with software updates. The only other complaint that keeps coming up in reviews is trouble with customer support when a glitch or freeze results in inexplicably large loss of chips. This issue suggests that you might want to avoid buying large sums of extra chips but instead stick to the free level of play. The game itself is visually appealing with simple graphics that are not flashy and do not distract from the game play, as some graphics heavy games often do, but are clear and easy to follow. The game allows uploading of photos for customizable avatars which allows you to upload a picture of your cat, or your neighbor, or some minor celebrity, all of which are great strategies for messing with your opponents and stealing all their chips. The app has all the game play features that you would like in a Texas Holdem game including Sit-n-go tournaments, ring games, and personal chat, plus a few nice features to make mobile play easier like preventing phone time-outs, silent mode with vibration, and the ability to store game data on the SD stick. Overall Poker King does provide an enjoyable poker experience for all levels of poker skill and experience but especially for new players who just want to learn and practice the game of Texas Holdem without the stress of real-money stakes. Poker sharks might not find the most challenging games on Poker King due to the high proportion of beginners, but what better way to kill some time than by cleaning up on poker novices?